You may have heard of that famous Japanese woman who implores you to organize and declutter your home and only keep items that spark joy. Yes, if you haven’t heard of Marie Kondo or watched her new Netflix show featuring her KonMari method of decluttering, you may want to take a few hours of your day and chill…while Netflixing, of course. But organizing your life shouldn’t just be restricted to your home, but also your office, school, and even your car. And yes, even how you store all of your reusable bags. Here are some tips from the show that can be used while you’re doing basic errands throughout your busy day. The beauty of the Click & Carry is that it is a handy, small device that allows you to declutter all the many bags that you’re carrying. All you need to do is place your bags inside the easy-to-grip Click & Carry handle, twist, and click. You don’t have to worry about hurting your wrists or fingers, but instead you now have a quick and easy way to carry your bags. Easy peasy. Say it with me now. Recycling is NOT a bad word. Reusable is NOT a bad word. When you grocery shop, why not invest a few extra dollars in reusable bags which are not only good for the environment, but allow you to save a couple extra cents when you buy your groceries. Click & Carry works both for regular and reusable bags, but the reusable option is WAY better, we think. The KonMari Method emphasizes only keeping the items that spark joy in your life. If you don’t feel anything, why are you keeping it? This makes total sense whether you’re cleaning your apartment or organizing your car. And it definitely makes sense when you’re going shopping for necessary items. Gadgets are King. Like Click & Carry. Marie Kondo loves boxes and compartments. So do we. We’re a huge fan of using useful items to organize our lives. That’s why we believe in Click & Carry so much. 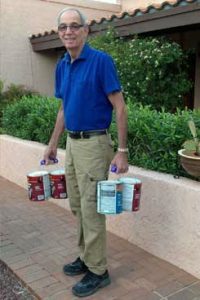 It’s the first product to make carrying groceries, sports equipment, and even paint cans…a breeze. Click HERE to purchase your very own Click & Carry today. As the holidays approach, all of us crafters gather with delight waiting until its finally acceptable for us to post our holiday crafts and ornaments onto all our respective social media channels. 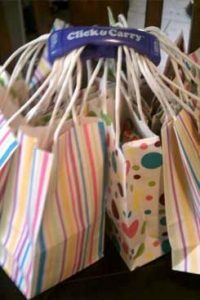 Now, how can Click & Carry help you, the creative and thrifty crafter, with your holiday shopping needs? When you’re running around various arts supply stores, you don’t want those annoying and painful indentations on your hands that plastic bags can give you. Instead, put your bag handles into the grooves on your Click & Carry and just sling it over your shoulder. It can carry up to fifty pounds and it just saves you the trouble of making multiple trips to and from your car. Amazing, right? Who wants those ugly marks on your fingers, wrists and hands from holding too many plastic or paper bags? 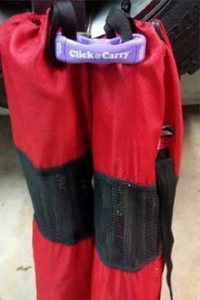 With Click & Carry, all you have to do is put the bags into the two grooves for the bag handles, click it, and then carry the regular way or just sling it over your shoulder for a hands-free carrying experience. Did you read that? Hands-free! We love it. Us crafters are pretty obsessed with things being visually entertaining and appealing. We want pretty and handwoven crafts that we can immediately put on Etsy, Instagram, and Pinterest, so why can’t that extend to products that help us carry our beautiful crafts around? Right now, Click & Carry is offering 25% off your very own Click & Carry with the code ‘Holiday25.’ So…please feel free to craft away. Oh, and check out the above video about crafting and Click & Carry.